This is the piece I posted about yesterday. The JTS did some major repairs on it and then I did a custom paint finish for a client. The JTS appreciated all the comments on his furniture repair skills. But please…ya’ll don’t give him too many pats on the back….he’ll be hard to live with. The paint color is Behr paint color Porpoise mixed in Behr Marquee paint! What do you think? My client was happy with the results. I do not like the painted dresser. However, I think it does not matter what I think about the owner’s choice. Let the owner do whatever they please with their furniture. Kathy, I LOVE IT!!! don’t let those nasty comments get you down. 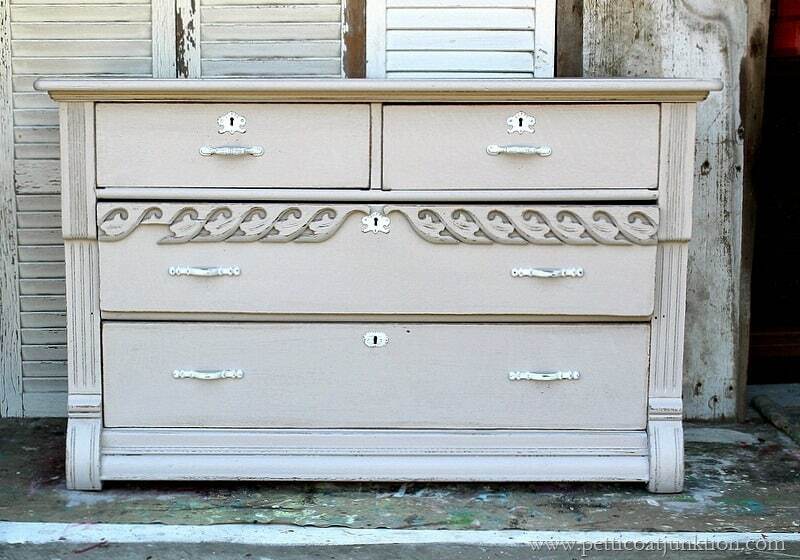 Personally, I love painted old furniture. I probably would have not painted the hardware, but that’s a personal choice. I LOVE IT!! 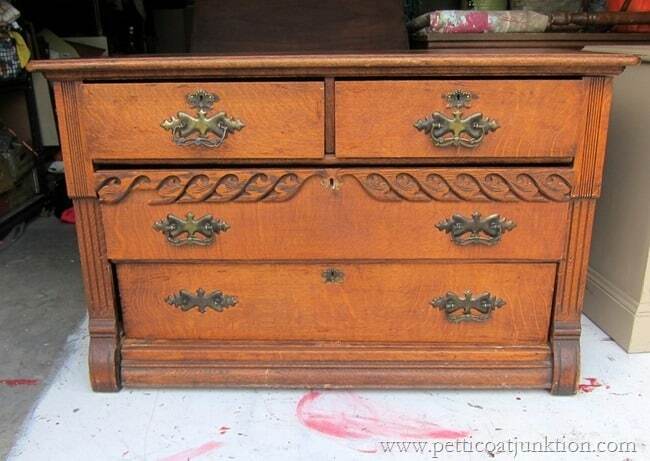 I love the dresser. The great thing about decorating is that we’re all free to create an environment we enjoy living in! Those details are really interesting. I don’t think I have ever seen anything like it. And, the paint really brought it out. It’s funny how paint does that. Oh, absolutely~you have to please the client. I happen to be an oak girl. Looking forward to the next finished piece. My motto on to paint or not is this…do what you want. Pretty simple really, and if it’s a custom order, you do what the client wants. Period, end of story! I like it painted. I do like the original hardware better but it is a neat piece. I really love the way it looks and it makes the decorative piece standout more. Lovely….but, to paint over that beautiful oak makes me cringe. This makes my heart ache!! That was a gorgeous piece…with original hardware that has been totally ruined…and is not at all beautiful….all the beauty is under the paint…with ‘made in china’ hardware…how very sad…. Dolores, If the piece was mine I would not have painted it but the client commissioned me to paint the piece, selected the paint color and told me to change the hardware. Yes, pieces like this bring out emotion in people and I definitely respect your opinion on the matter. Thanks for your comment. Perhaps you shouldn’t be on this blog. If you can’t appreciate the work that went into this piece and all you can do is criticize then move on, as this is not the blog for you. Your mother obviously never taught you “if you can’t say something nice, don’t say anything at all”. I like the original finish too Karen but the piece belonged to the client and she wanted it painted. 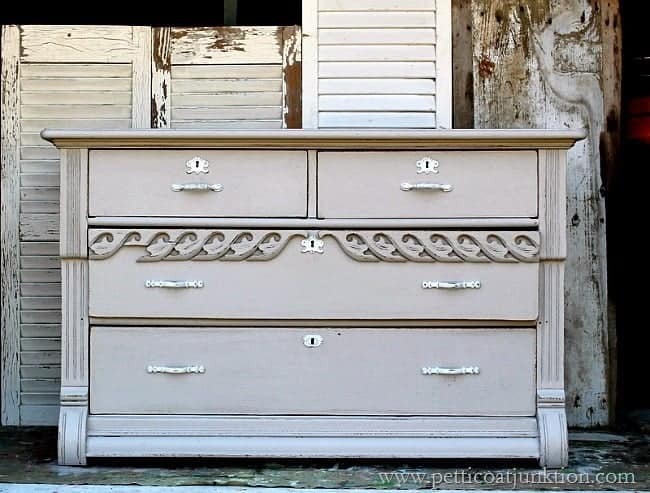 I love how the dresser turned out, it is gorgeous. You do such beautiful work. Tell the JTS not to get the big head just because he is Mr. Wonderful LOL. I can meet any day, Monday through Thursday. H a great day.